I trust the holiday season is going well for all-- aside from the usual impromptu parties with no safe food choices and the hostess gifts that are nuts rolled in other nuts topped with almonds. All that aside-- there's lots of eating going on. 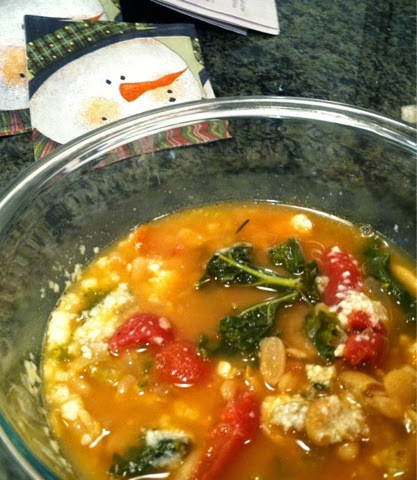 So, to combat that "I'm so stuffed I'm going to pop" feeling-- how about a nice Italian soup for the New Year? I make a light version of " ribollita"-- which means " reboiled" and, traditionally, Parmesean cheese and day old bread round out the serving of this soup. But my version is top 8 allergen- free; it does contain tomatoes and garlic which can be allergens. One can easily eliminate these ingredients; I'll note how. 3 tablespoons olive oil-- to lightly cover bottom of pot. 1 bunch kale, washed thoroughly, leaves stopped off. Coat bottom of pot with oil and heat briefly on medium. Put in carrots, onion, garlic, celery and cook on low for 5-10 minutes until those vegetables are soft. Stir so nothing burns. Add tomatoes--cutting them in half and adding some of the liquid. Bring to a simmer-- you want to reduce the tomatoes slightly--for 10 minutes . Add rosemary (a stick or two), pepper to taste. Add stock/ liquid and cannellini beans and bring to boil. Reduce heat to simmer for 15-20 minutes. Add kale leaves and stir. Cook another 7-10 minutes. This soup can be made in advance and reheated ( on low) to serve. ***If your family eats dairy-- melt Parmesean or peccorino on top. Family, Food Allergies-- Sometimes They Just Don't Get It! Sometimes families just don't get food allergies. Did I? Do I! Don't we all. Like I didn't know that? Like we-- like my son -- had to hear that? Like my parents saying "poor boy" would change anything? ***Yum, this lunch is delicious. We need you to be happy to be sharing the meal--and we need you NOT to be so focused on the "can't haves." Here's how to make the ribs--super easy but they take a while in the oven. Pork spare ribs -- about 4 pounds. A sprinkle or two of chile powder. Mix vinegar and at least 1/3 cup honey in a cup. Stir until well mixed. Pour over ribs which are in a roasting pan and are, more or less, room temperature. Sprinkle the ribs with pepper and garlic salt a little chili powder. 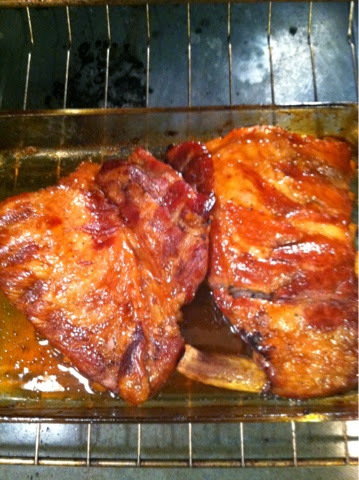 Let marinate for about 30-45 minutes-- turning ribs over a few times. After the ribs marinate, pour off the liquid--but reserve it. Drizzle a fair amount of honey on them. After 10-15 minutes, turn oven temperature to 325. Tent the pan with foil, which you take off for last half hour. Again, take tin foil off for last half hour so ribs get nice and brown. As I start the holiday cooking for my brother- in- law's feast, I thought I'd pass along some tricks I use. Happy and safe holiday to all. Substitute one 3.9 oz applesauce-- that's one individual cup-- and one cup Rice Dream for the 1 1/2 cups Buttermilk the Glutino box suggests. I use Ener-G Egg Replacer -- doesn't everybody! Rice Chex. I pulse them in the blender until coarsely ground. And mix in my salt, pepper, minced garlic and parsley. And viola! Mushroom stuffing. I never used cheese, so don't have to substitute for it! I always used olive oil instead of butter to coat the bottom if baking dish and I drizzle water and olive oil over the pre cooked mushrooms-- with the stuffing in it-- to keep it moist. Food Allergy, Holiday Meals and Family! All of the above is the correct answer – and then you get the baking mix from the cupboard and read about how to make a strudel. And this is especially true around holiday celebrations when ritual meals, steeped in tradition , are the standard fare. Food allergies can cut us off those traditions, memories—whatever you want to call those remembered moments from our past-- and not allow us to make those dishes. But we can’t make them. And neither can my mother or my Aunt Sadie. Instead, I can make a menu that does not include allergens—and no one will know the difference. I can ask Cousin Pesky to bring a green salad—since that would be ‘easier’ for her—and ditch the strudel altogether. I may feel a pinch at giving up a family tradition, but what really makes the meal a tradition is that we gather our family and close friends to share it. That part doesn’t change. As parents we must smooth the way for a happy holiday. People may mean well, but don’t have as much practice at keeping our children safe—or people may not want to change their habits. Whichever the case, your child will have a happy and safe holiday because you –and possibly only you—make the effort to prepare and bring a special meal or host a worry-free fete. That you must think ahead, prepare, and possibly reorganize tradition—that is a given in the food allergic household. But, above all, we must remember that --while the menu may need to change-- the message of these holiday meals does not. What we are eating should not be as important as who we are eating it with— as well as the laughter and gusto we bring to the table—no matter if it’s ravioli or rice cakes and jam. The love, the sharing, the connection are what truly matters and there is no substitute for that. Ok. Maybe I'm not French, but I felt community, fraternity( and sisterhood) and equality this weekend at the FARE Teen Summit. Once again kids gathered and bonded over being just like everyone else in the room -- and video games and karaoke and hair cuts and school and dating and bullying and allergens and Epi-pens. While parents talked about eye rolling and 504s and college planning and Epi- pens. It was fun. It was tiring. It was informative. But mostly it was about finding community, sharing strategies and making new friends. For me, oldster that I am, it was seeing old friends too. Friends I met at previous Summits-- and sharing pictures of our college age kids and telling the middle school folks-- you can do it AND it gets easier. I'm very grateful for my food allergy community and the opportunity to speak about my experiences. And I learn something new every time -- like there's a mobile help alert system( wireless) that you can get your child (ok it's sort of like an old person's Life Alert system). So if he's alone and having a reaction or she passes out-- someone calls and help is sent. Something to think about. So great to see everyone, and as I said in my presentation: it's doable-- and remember it's Who is at the table-- not what's on it that counts. Putting the finishing touches on my new cookbook Allergy Free: College Cooking. This one I'm publishing myself because I want it out there and helping kids cook ASAP. 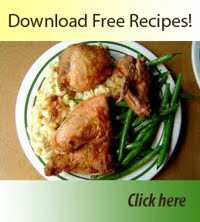 Easy recipes for basic fare-- meatloaf, roast chicken, chili. And then there's all the Italianate recipes: like minestrone. Escarole and beans. And kale with garlic. I'll keep you all posted when it hits Amazon-- and, it's good for any new cook-- college student or not, food allergic or not. Simple good food that's easy to make with ingredients from the grocery store. And NO Dairy, Eggs, Nuts, Peanuts, Wheat, Soy, Fish, Shellfish or Sesame. Support me on this one! And see you at the Teen Summit! As you all know, I am a big proponent of FARE's Teen Summit. Teens get to be with other kids who have had the same experiences. AND they get to mentor younger kids about getting through situations from bullying to eating out to dating to travel. Seeing these kids together in a room, you can almost hear the collective sigh of relief. This Summit I'm on a panel with two fabulous women-- we're talking about "success". Doing mostly everything--travel, summer programs, sports, camp. Always thinking " it's doable"
It's who is at the table, not what's on it. See you at the Teen Summit. So I've been doing some research on hamburger buns at sporting arenas. Yup-- hamburger buns at sporting arenas. As of September, my son can add wheat into his diet (yay) and end-of- summer means the US Open Tennis championships and lots of baseball. So... I was calling around. At the US Open, Levy Restaurants -- Chicago based-- runs the concessions. In hope of getting a burger with bun at our all- day outing, having been greenlighted on Wednesday at 5, I called Levy headquarters. Even in Central time it was still awfully close to closing, and the operator who helped me was respectful of my need for an ingredient list and promised to reach out to their vendors. By noon Thursday- less than 12 hours later!--I had an ingredients list in hand! And my son and I had burgers for lunch! Ditto "shout out" to the food services manager at Yankee Stadium who gave me his cell phone number and sent me the hamburger bun ingredients. The point here is WOW people are really nice and helpful. And, as I noted to various supervisors, these folks were respectful of food allergy needs and knowledgeable about their dangers. So I encourage parents to call and inquire and get all the help you can from these helpful restaurant suppliers. Brand name chain restaurants may not use the same products in their stores as they use at a stadium or arena. Case in point: Johnny Rockets: the buns and burger ingredients listed on the website are ONLY for the restaurants. At stadiums--Yankee Stadium, for instance--Johnny Rockets is supplied by an outside vendor, and the ingredients are different. And use the parents' best defense: our mouths! Ask a lot of questions and expect the best from people. Vacation! I've been away -- sorry for the radio silence. We chose, as we often do, a cruise with Holland America line. We had a great time-- especially because it's truly a vacation for my son-- safe food made specially for him-- and me-- no cooking! And another benefit is the same wait staff very night for dinner-- staff who strive to make your experience the best it can be. AND there's simple easy food throughout the day for snacks: clean salad bars with no allergenic foods like nuts or fish. Carving stations manned by trained servers who always use separate utensils for each food. Steamed vegetables and plain rice available for every meal. Now there's even quite a few gluten free options, good for some folks though not us. And there's fruits and this time, sorbet flavors for dessert-- that was a great thing since that hasn't been the case on previous cruises. I didn't know so i brought chocolate --- usually desserts are an issue because there's only the occasional Jell-O. But I think cruise lines are trying to serve healthier foods which works out for us. There were Skittles also on the ship. It may seem that I am making a big deal about some dessert-- but there is a focus on food on a cruise-- not so much on this cruise line but still at dinner there are three courses and it's nice if you're not eating dessert while your kid is sitting empty plated. It speaks to quality of life -- my son's, mine, my husband's-- that these little things can make a BIG difference in how much relaxation is actually in the vacation. And this cruise there were many options for dinner as well as fewer substitutions-- food allergies seemed to fade into the background. My son had choices of different meals to eat -- instead of having one safe dish that had to be stripped down to be safe. So we had smooth sailing and good memories! Italian granita is a deliciously refreshing treat on a warm day and a good dessert choice. It's grainier than sorbet and usually less sweet-- given that the most popular flavors are coffee and lemon. 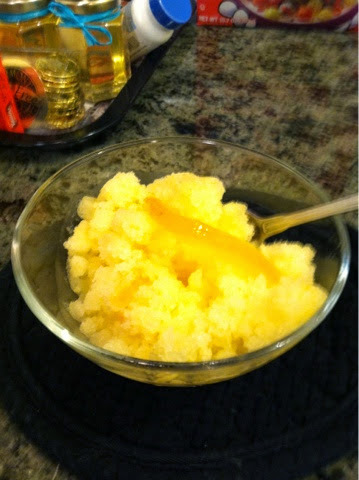 So -- you all knew where this was going--last night I tried making granita. The true Italians pour the sugar and coffee (or lemon) into a pan and put it in the freezer and then stir every 30 Minutes!!! --for a couple of hours. But, I'm much lazier than that. mini- food processor. And violá I had granita! Orange granita-- which was more of a hit than lemon at my house. Get those orange ice cubes out of the tray, pulse in food processor until the mixture is crushed but not slurry. Got excited about new ingredient in some sauces I saw talked about in a magazine. Adzuki beans. So I thought "wow" an addition to spice up an old meal or a add to a new meal. So, being well trained for due diligence after 20 years in the food allergy world, I looked up what an adzuki bean is and where it comes from. This bean was harder to research than I thought. And I still have not found hard science site, though I have read a number of blog sites and personal stories. These blogs say that Adzuki beans, or aduki beans as they are also called, are related to the soybean. One even suggests that if your child is allergic to soy, do not try adzuki beans. So we won't be trying those sauces just yet. Darn, I'll have to make my own chimichurri. Why would a patient need both an Epi-pen and an AviQ? Why would a hearing patient need an AviQ? Why. Why. Why. First the care coordinator. Then the approving doctor. Then the medical director. And I still don't have the meds! Why Epi and AviQ: because carrying an Avi when exercising, for instance, is easier than an Epi. Why would a hearing patient...which is exactly the wrong question-- the AviQ speaks so you'd have to hear. Are the companies not educating insurers because they're fighting over patient loyalty? Are these companies fighting dirty over US. Isn't American business built on Ford over Chevy? And Macy's over Gimbels? Is their business model getting in the way of our safety? And our quality of life? I know FARE is working on advocacy-- but let's raise our voices too-- for educating the insurers about why we'd want the choice of different products. At a party yesterday a woman came up to me and said "Thank You. " I smiled and asked, for what? Well, it seems that years ago when her granddaughter was struggling with eczema and hives and vomiting after certain foods, I suggested it might be food allergies. And when it was food allergies, I made a list of ways to navigate playgrounds and parties and family events. As well as gving her the FARE number and ways to talk to family and friends about food allergies. I was the elder statesman even then, having helped my son navigate his multiple food allergies for 18 years. But who knew that sharing my experiences and my " combat" knowledge would be so important to others. Now I know-- and I know that sharing how we did it, how our kids did it can really help the next generation get through the rough spots. Like birthday parties or, now, college dining halls. We didn't mean to be pioneers, but we were. The first kid in school allergic to peanuts. The first mom in the playground asking to wipe other kids' hands. ( Just call me " crazy mom"-- they all did!) The first family to request a conference with the college nutritionist. And the first group of folks to get their teens together for a Food Allergy Summit. And what came out of all that-- especially the Summit-- was Community. The idea that we"re all in this together**and we can all make a difference. To make pie without eggs. Or show your school nurse how to use an Epi-pen. Or call that friend-of-a-friend who just got diagnosed-- YOU can make a difference. Hope to see folks at the FARE conference this weekend. Looking forward to meeting other parents of college age kids -- want to talk about moving away from the safety of home and the kinds of emotional challenges that brings too. Meatloaf -- mine's made with chopped chuck, salt and pepper, lots of chopped garlic( 3 cloves for 2 pounds of meat), chopped parsley-- about a handful-- and two cups of Rice Chex-- smushed. Form a fat pancake shape and put in a frying pan over high heat until the bottom browns well. Fats will be released and these can be drained. 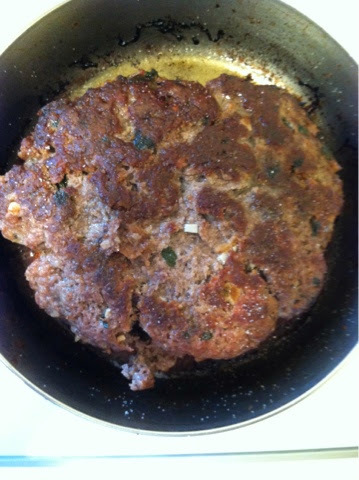 Turn meatloaf over ( spatula is good for this-- a fork will not work!) and brown on the other side. When browned on both sides, turn heat to medium, put cover half way on pan-- tilt it-- And cook for twenty minutes. You can also bake a meatloaf in the oven for 25-30 minutes on 350 degrees. When I bake meatloaf I wrap a few bacon strips around it to keep it moist. My hometown paper-- okay it's the NYTimes--had a special Dining section on bread today. Nine pages of luscious pictures, recipes, directions to artisanal bakeries making Old World specialties and New World techniques. And every page a reminder of what is off limits in our house. What makes my kid turn pale and lethargic and throw up. I know--I'm usually the optimistic one, the solution finder, the person who makes damn good lemonade-- but today all I felt was rising frustration at the very plain limitations of food allergies. I know that anger saps one's strength and frustration clouds my vision-- but there it is. Nine pages of food shouting "Do Not Trespass" " Stop, Do Not pass Go" "Off Limits. " In past, I'd rev up the mixmaster and bake my own. But today I'm going to sit with these feelings and see what rises. This is the time of year when college decisions are being made, and it's tougher when food allergies are in the picture. When our family-- that is my son-- was looking at schools we decided-- he decided--that food allergies would take a back seat to what school was the best fit: academically, socially, location and so on. That decision was a good one, as was his choice of school; he's happy and thriving. As for the food experience all the ahead- of- time due diligence and communication was not enough. The school was just not prepared for food allergic students-- though they thought they were. But we found ways to make the food work. And, I want to note that there were some folks -- nutritionists, dining admins and staff--who tried to be helpful, though the gap was wide between the promise and the execution. But, as all food allergic families do, we found ways to make it work. Or my son did. He had a micro fridge. ( yes a microwave and refrigerator in one-- standard issue by vendors who service colleges). And he got lots of care packages. And once his RA made cookies for him-- I sent the mix. And every couple if days my son went to the store to get cold cuts, beans, baking potatoes, rice cakes etc. And the list of his personal accommodations goes on and on. For us, choosing a school was not only about food allergies-- and he picked a great and the right place for him. And honestly, as we all know, life is often not a straight and smooth road. One has to find a balance. So did I tell you the one about me and airline security and a tub of frosting??? Heading off to see my son at college I packed up my three items of clothing, an extra pair of boots, and, of course, fried chicken and a birthday cake. In past, I've been stopped for Epi-pens and one-serving applesauces. But that was years ago. So when the lovely TSA guard pulled my bag off the line and asked me to step over, I was confused. She was joking around and very nice -- especially considering we were flying after one of those snowpocalypse days where hundreds of flights had been cancelled. She opened my suitcase and saw the fried chicken-- laughing that I must be going to see a kid. Then she saw the tin foil frisbee-like object-- the cake all wrapped up and started really laughing. Then, she rooted around keeping her eye on the X-ray and pulled out my tub of chocolate frosting like a prize. Oh dumb me-- I totally forgot that I had the frosting, that it was a " gel" and that it was way over the 3.4 oz limit. My TSA guard had tears she was laughing so hard-- saying how delicious their lunches would be topped with frosting. I felt so silly--and as she swiped it down with the tape that detects explosives, I told her stop. Her job was done-- I could easily buy another $1.99 tub of frosting and she could have this one for show and tell in the break room! Silly traveler tricks. So now my family thinks it's uproariously funny to discuss my "chocolate plastique" airport episode. Maybe they're right! Article below from New York Times business section. 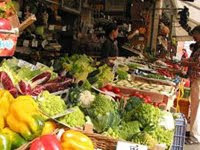 Be sure to note that the average grocery customer leaves the store having paid $33.00 and the average gluten free customer leaves having paid $100.00. Food allergies, as we all know, can raise the grocery total significantly. I often buy bulk from Amazon-- for good pricing and convenience of one- stop shopping. Also, interesting to note how industry folks in this article say, in a factory setting, "wheat floats" and discuss the need for a " captive facility"-- known to all of us as a " dedicated line or facility." Heaven Mills Pita Bread and it's Kosher!